For weekend lunch I made this turai sambar, peerkangai thol thogayal, vazhakkai varuval, banana peel thoran (poriyal) and paruppu rasam. 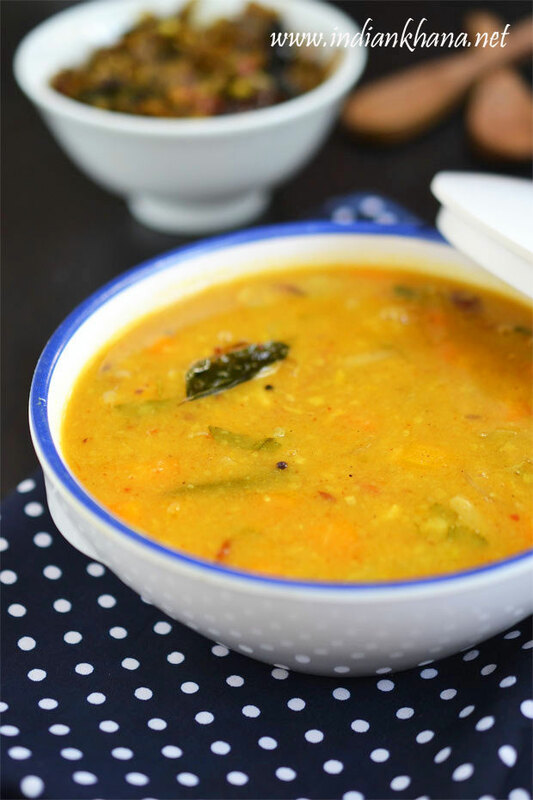 Now a days am doing full Tamil or South Indian lunch menus a lot for some unknown reason and it's very good thing :) So if you make only turai dal then do try this sambar too for a delight ful lunch. 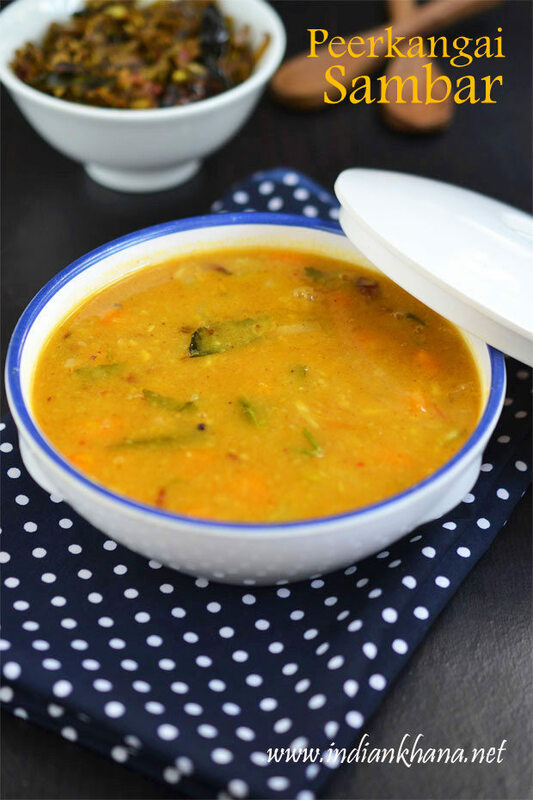 Delicious sambar with ridge gourd, good side dish with rice. 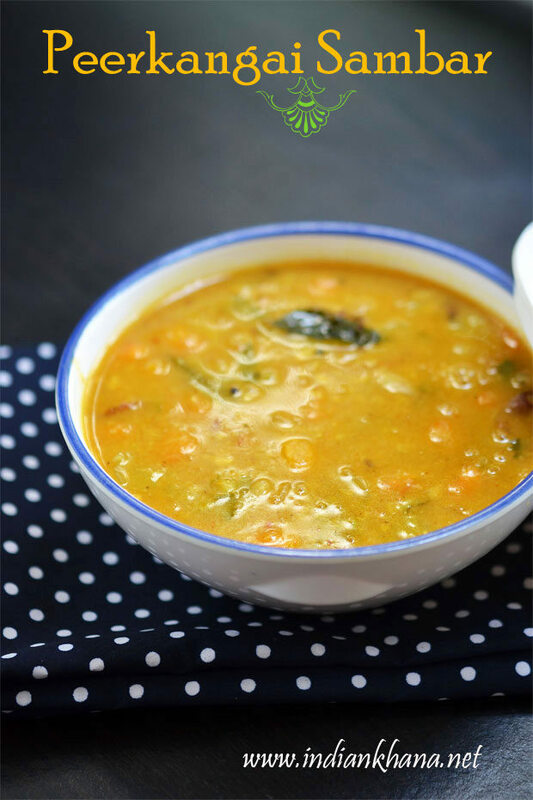 Wash and soak dal for 10 mins, soak tamarind in 1 cup water meanwhile peel and chop ridge gourd/turai, carrot, slice onion, chop tomato, coriander leaves, slit green chilies and finely chop garlic. Pressure cook dal, ridge gourd, carrot with 2 cups water and turmeric powder for 4 whistles or until cooked, allow pressure to release and mash dal gently, keep aside. Extract juice from tamarind. Heat oil in a pan or kadai add hing mustard seeds, cumin seeds, methi, garlic, curry leaves, green chili and saute until garlic becomes golden brown , add onion and saute until onion becomes light brown and soft. Add dal with veggie, 2-3 cups of water, salt and mix well, cover and cook in medium flame until boil comes. Remove any forth if comes on top and simmer for 5-7 mins in medium flame, add coriander leaves mix and off flame. Serve hot with rice and any poriyal or stir fry as side. I made along vazhakkai varuval (plantain stir fry), peerkangai thol thogayal, used banana peel to make thoran with paruppu rasam. Don't waste the ridge gourd or peerkangai peel, make the thogyal which can be serve with rice too. You can skip garlic, you can reduce sambar powder to 1/2 tbsp or 2 tsp if your sambar powder or green chili is very spicy. You can chop ridge gourd and saute with onion instead of cooking it with dal, in this case you can see the ridge gourd pieces in sambar. 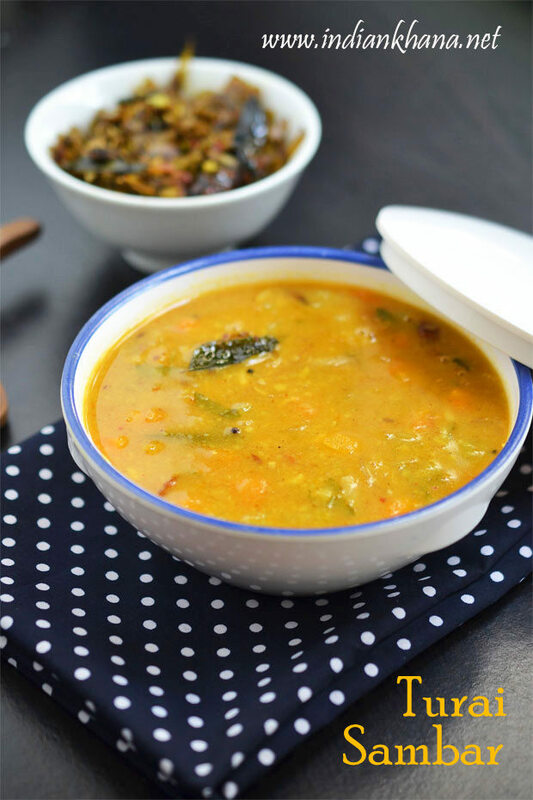 I personally like to do the quick version of cooking ridge gourd with dal when in hurry.